Rocket: Emmaus College students Harrison Marshall, Brandon Clarke, Kaileb Handley, Matthew Hill, Ethan Sladden with their creation. EMMAUS College students have refined their skills at the recent RACQ Maryborough Technology Challenge. The teams showcased their human powered vehicles over the two-day event. The challenge aims to showcase various technology subjects taught at schools including robotics, human powered vehicles, Co2 dragsters, solar boats and more. 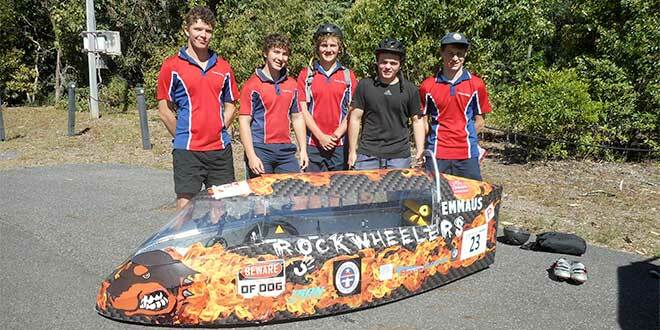 The Senior Emmaus College team, the Rockwheelers, placed twenty-seventh, completing 585km and won their design, make and race category. The college junior team, the Koolrunners, returned thirty-fifth from 150 starters completing 565km in the 24 hours. The teams saw success leading up to the event, taking part in Challenge the Mountain as well as competing at the Benaraby Raceway. Industrial technology and design teacher Peter Jensen said the success was possible due to the hard work and dedication of the students. “This year’s DMR car, the Rockwheelers, qualified fastest at the Benaraby eight-hour race a month ago and won the school built car category finishing fifth overall,” Mr Jensen said. “This year we have a second car, the Koolrunners, which is a revamped version of our 2015 car sporting a new body and will be entered in the Innovation category at Maryborough.